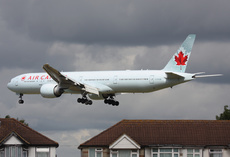 A Boeing 777, operating as flight AC088, departed Shanghai, China at 11:23 UTC, travelling toward Toronto, Canada. The flight was planned for 13 hours and 40 minutes. About five hours into the flight, the flight crew received a meteorological information bulletin that forecasted an area of severe turbulence over the southern coastal mountains of Alaska. Approximately two and a half hours later, 35 minutes before entering the area of known turbulence, the first officer directed that the inflight service be stopped and that the cabin be secured. Seat belt signs were turned on, and several announcements were made in English, French and Mandarin, stating that the flight was approaching an area of turbulence and asking the passengers to fasten their seat belts. Despite these measures, many passengers were not wearing their seat belts when the flight encountered severe turbulence. During the turbulence encounter, 21 passengers were injured, one of whom sustained a serious injury. Once the turbulence subsided, first aid was provided on board the aircraft, as the flight diverted to Calgary, Alberta, Canada. - Air Canada flight 088 entered an area of moderate to severe turbulence that was caused by the jet stream traversing the southern coastal mountains of Alaska. - The acceleration forces encountered resulted in passengers who were not wearing seat belts contacting various furnishings and surfaces in the cabin causing a variety of injuries, including 1 serious injury. - If training material does not contain complete information pertaining to all of the factors that contribute to turbulence, then there is a risk that the best course of action will not be taken. - If flight crews and dispatchers do not receive all pertinent information relating to flight conditions, optimal decisions on a course of action may not be made, increasing the risk of exposure to adverse conditions. - If systems such as an aircraft communications addressing and report system are not utilized to their full capacity, then there is a risk that more detailed information about flight conditions will not be available. - If cabin lighting is not sufficiently bright, then there is a risk that cabin crew members will miss unfastened seat belts due to the lack of contrast of the seat belt material and concealment by blankets. - If there is no visual or audible indicator associated with not wearing a seat belt, then there is an increased risk of non-conformity with respect to seat belt use. - If seat belt announcements do not contain sufficient detailed information on anticipated turbulence, then there is a risk that passengers will not immediately comply and maintain compliance with an instruction to fasten seat belts. - If safety announcements made by cabin crew do not use language that conveys the expectation of compliance, there is a risk that passengers will perceive these announcements to be less authoritative, which may result in non-compliance. - If passenger safety briefings lack information on the effects turbulence can have on individual passengers, their possessions, and on others, then there is a risk that it will reduce the probability of seat belt use. - If passengers do not expect consequences and enforcement for non-seat belt use, passengers may not perceive the use of seat belts as mandatory, when so directed. - If the approach to improve seat belt use does not include an understanding of the cultural and social norms of passengers, education to increase awareness, improved attitudes and an associated enforcement program to ensure corresponding changes in behaviour, then there is a risk that passengers will not wear their seat belts. - If V-clamps are not installed using the proper procedure and torque, then there is a risk of V-clamp failure and subsequent partial loss of an air conditioning system and cabin pressurization. - The Air Canada flight 088 flight crew's decision to secure the cabin and reduce to turbulence penetration speed contributed to preventing significant numbers of injuries in the cabin and potential damage to the aircraft.